I’ve been designing/building/testing/ripping apart/putting back together again a library/app/framework/tool thing that allows us to assemble an asset allocation algorithm for each of our ten or so products1, each of which may have been modified at various times since inception. It’s been interesting and not a little fun, plus I’ve been climbing the C# learning curve (through the three versions shipped since my last serious exposure) like Chris Bonnington on amphetamines. Our products are broadly similar but differ in detail in some places. So there’s lots of potential for reuse, but no real hierarchy (if you can see a hierarchy in the little chart here, trust me, it’s not real). So Product A need features 1, 2 & 3, in that order. B needs 1 & 4, C 1, 3 & 5, etc. What I came up with was to encapsulate each feature in a class, each class inheriting from a common interface. Call it IFeature or some such. At run-time, I can feed my program an XML file (or something less ghastly perhaps) that says which classes I need (and potentially the assemblies in which they may be found), applying the wonder that is System.Reflection to load the specified assembles and create instances of the classes I need, storing them in, for example, a List<IFeature>. To run my algorithm, all I need to do is call the method defined in my interface on each object in turn. A different product, or a new version of an existing one has a different specification and it Should Just Work. So changing a single feature of an existing product means writing one new class that implements the standard interface and pointing the product definition at the library that contains the new class (which may – should – be different from those already in use). The discerning reader may, er, discern that there are elements of Strategy and Command patterns in here as well. Aren’t we modern? While all this is very exciting (to me at least – a profound and disturbing symptom of work-life imbalance) it’s still not the end of the line. I’ve built functions and then chosen to access them serially, relying on carefully (or tricky & tedious) XML definitions to dictate sequence. I’m thinking that I can go a long way further into declarative/functional territory, possibly gaining quite a bit. And there’s a whole world of Dynamic to be accessed plus Excel and C++ interfaces of varying degrees of sexiness to be devised . More on much of that when I understand it well enough to say something. 1 There are billions at stake, here, billions I tell you. I’d forgotten how flat-out fast compiled languages, even the bytecode/IL kind could be. It’s not a completely fair comparison, to be sure, but a Ruby script to extract 300,000 accounts from my Oracle database and write them as XML takes a couple of hours, mostly in the output part. A C# program handled the whole thing in 5 minutes. Then processes the accounts in about 30 seconds, of which 10 are spent deserializing the XML into objects, 10 are serializing the results to XML and 10 are performing the moderately heavy-duty mathematical tranformations in between. Lacking at present a paid-for version of Visual Studio 2010 (the Express Edition, while brilliantly capable, won’t do plugins, which precludes integration Subversion and NUnit, to name but two essentials), I have been enjoying greatly my experience with SharpDevelop, which spots my installs of TortoiseSVN and NUnit and allows both to be used inside the IDE. It’s not perfect: there are areas, particularly in its Intellisense analogue, where exceptions get thrown, but they’re all caught and I have yet to lose any work. While the polish is, unsurprisingly, at a lower level than Microsoft’s, it’s entirely adequate (and I mean that in a good way) and the price is right. I particularly liked being able to open an IronRuby session in the IDE and use it to interact with the classes in the DLL on which I was working. While I expect VS2010 to become available as the budgeting process grinds through, I’m not at all sure that it’ll be necessary to switch. An extended set of automated refactoring tools could be attractive, although Rename and Extract Method are probably the two most useful, productivity-wise, and they’re already present. I would rather like to have Extract Class, which isn’t needed often but would be a big time (and error) saver when called for. On another topic entirely, should you be looking for entertaining reading in the vaguely technical, erudite and borderline insane category, may I recommend To Umm Is Human to you? 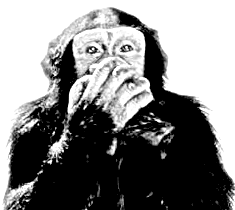 Any blog that has “orang utan” amongst its tags is worth a look, I’d say. If you like it, you’ll like it a lot. I was once made redundant by a Doubleday, but I don’t think they’re related. There’s an interesting new programmer-oriented podcast on the block, too: This Developer’s Life has slightly higher production values that may ultimately limit its life – the time to produce an episode must be substantial. I found myself wanting to join in the conversation with stories of my own, a sure sign that I was engaged in the content. When we want Excel to talk to a compiled library, the list of options available to us is not long. On the one hand, we can write a compiled library that references the Excel SDK (pre– or post-2007), setting its prefix to XLL for convenience, typically we’d grit our collective teeth and accomplish this with C or (cough, spit) C++. One big plus here is speed – we’re talking to Excel in its own language. Or something awfully close to it. Another plus, of course, is that this approach probably involves the minimum set of dependencies for non-enterprise distribution convenience. If you haven’t spotted the big minus then we should probably agree to disagree on the relative merits of programming languages. On the other hand, we can write a library that exposes its functions through good ol’ COM, referencing it though the Tool…Add-ins dialog. That’s probably still the best-known way to integrate functionality developed in .NET, although it does involve paying a performance price as the COM interface is crossed and recrossed. This would be the place in the world most usually occupied by VSTO. Of course, you could also write your COM library in non-managed code: VB6 is easy (if you can find it) but slow, the choice from others depends on your capacity (or desire) for pain. On the gripping hand, we have ExcelDNA, which for my money is one of the all-round cunningest things you’re likely to come across in quite a long time. (Unless you’ve already encountered its cunningness, of course, in which case you’re probably already nodding along in sage agreement). How so? How about being able to write your spiffy new functions in C# but without having to incur the needless ins and outs of the wasteful and superfluous COM middleman? ExcelDNA provides a small XLL that can talk to managed code. There’s one attribute to set in order to make a function visible to Excel and one libary to import (in order to be able to add the attribute). Oh, and a little config file to tell the XLL what to load. That’s it. Actually, that’s the complicated version. In case you didn’t know, the CLR includes a compiler, allowing code to be created and compiled at run-time. The simplest way to talk to Excel from .NET via ExcelDNA is just to put your code directly into that little config file and let the XLL compile it at load time. OK, there’s a second or so’s overhead, but how simple – anything simpler would probably have to be involve 21st-Century language integration where VBA lives today. To get it running, I saved it as “RangeJoin.dna”, then copied the ExcelDNA.xll into the same folder and renamed that to “RangeJoin.xll”. 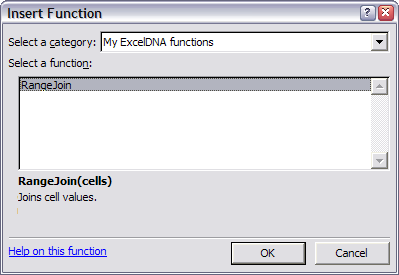 Because it isn’t currently anywhere on my path, I also put ExcelDna.Integration.dll in the folder. Then I double-clicked my new XLL file to start Excel and load the library. (Pictures below are from Excel 2002, but the code is tested up to 2007). I did notice the the =NA() output and the Euro amount came out different to what I’d have hoped. It rather looks like I’d have to dig a little deeper into the ExcelDna.Integration.dll and the ExcelReference object in particular in order to be able to access the equivalent of VBA’s Text property. Still, not bad for a quick exercise, I’d say. The last time I looked at XLW it was focused on C++. That’s changed in the interim – C# and VB.NET are now options. Possibly the first implementation, ManagedXLL is (was?) a paid-for product that looks to have been similar to, but possibly broader in scope than ExcelDNA. It’s not clear whether the company is still active or the product is still available – a curious colleague recently tried to make enquiries and failed.